Stereo handheld digital audio recorder and USB audio interface. 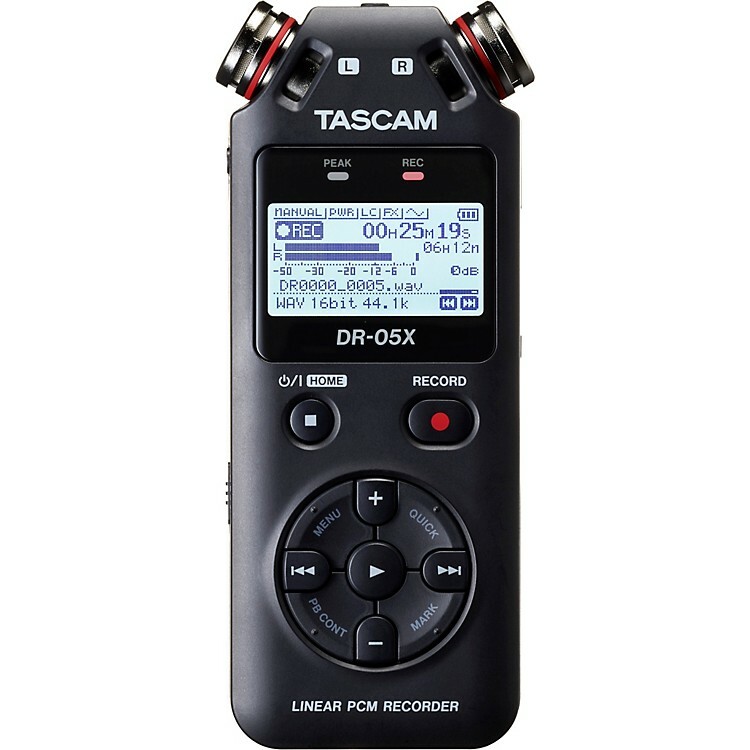 The DR-05X is a compact, versatile, professional-grade digital audio recorder that fits in the palm of your hand. The DR-05X is equipped with dual integrated professional-quality condenser mics to capture crystal clear recordings. It features omnidirectional stereo mics that are perfect for dictation, music and more. TASCAM created a totally revamped user interface, making it easy to adjust levels, delete takes, add markers and perform other common functions with the push of a button. Its bright white backlit display is easy to see, even in sunlight. The DR-05X also serves as a computer-based recording interface, incorporating a studio-quality 2 in/2 out USB audio interface. This feature makes the DR-05X a perfect fit for live streaming, podcasting and digital audio workstations. The built-in condenser microphones operate as USB microphones without any complicated settings changes. Multi-language menus in English/ Spanish/ French/ Italian/ German/ Russian/Chinese/ Korean/ Japanese/ Portuguese are included. In addition to its capability to capture crisp voice recording, DR-05X can help you with its instant Jump back function, variable Speed function and equalizer preset for human voice. DR-05X can automatically start recording when an input signal is detected, and Peak Reduction technology guards against sudden spikes in loudness. Recording modes include Overwrite Mode, which allows users to select a precise Record drop-in time for replacement recording with one level of Undo. Nondestructive Overdubbing allows you to record new sounds onto an existing recording while leaving the original file unaffected. DR-05X supports studio-quality linear PCM recordings up to 96kHz/24-bit WAV/BWF format, as well as memory-friendly MP3 format. With extended battery life and increased capacity for microSDXC cards up to 128GB, DR-05X recorders can quite literally record for days on end. Crystal-clear portable recording for voice and speech. Order today.